I was at the office around 5.30pm and was packing to go home when Gerakan called me to inform of a drowning case in Paya Jaras. I rushed from my office in Taman Equine to Gerakan in Semarak. The first team was already deployed when I arrived in my office attire. I had no choice but to put on a JPAM vest. After checking the inventory list, we started our journey in 1 Rodeo and 1 Delta lorry. With sirens blaring and strobe lights flashing, we made through the traffic quite easily. When we arrived, the first team updated us on the Intel. Its a 3+ years old child who was washing his slippers by the river. Suddenly he fell in. An old man nearby shouted for help. The nearby villagers didn't pay any notice as the old man was known to have some 'problems' before. Only after noticing a pair of children slippers did they realised that it was true. By then it was too late. I was just coordinating the ops, no heavy stuff, as I had a recurring back pain. 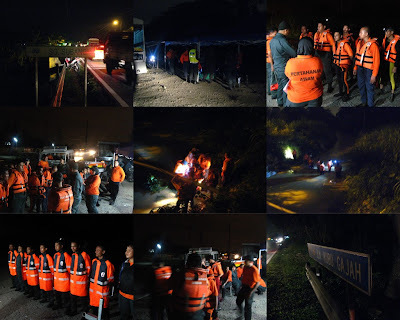 My team (total strength 20) continued our search, wading through the river from the incident point right up to the 'bigger' river a few kilometres away. We called off the search at 0300hrs. I had returned home at 0200hrs coz its working day. As I lay myself to sleep, I cant help but think of .... the body of adik x (cant disclose the name), still swirling in the river, or resting at the bottom of the river bed, or stuck among the tree branch...somewhere out there. I had problems sleeping now even though my eyes could barely open. I pray that we can find him soon, to enable his family to give him a final and proper burial. Yesterday I parted ways with my old friend. Known her since 1994 and she has been good to me. She has brought me lots of luck and brought me so much joy driving at breakneck speed...once a point a time when she was younger...haha. It originally belonged to my Tok Guru. He used it for 2 years and during that time, I had the privilege to ride in it on numerous occasions. Secretly, I had a wish that I could one day drive a car like that. Little that I know, by the grace of God, 2 years later, I managed to buy the same car from my Tok Guru. This is the same car that I had used to visit work sites, that got me my first project, that brought my babies home from the maternity ward, that rushed me to Bilik Gerakan 999, that took my family on holidays, that took me on my dive trips, that accompanied me during the trying times of my divorce etc etc. Its also the same car that caused me to miss appointments, had to hitch a ride with customers, ride my bike in the rain etc etc. So many memories as she was with me a good part of my adult life. I had resisted the idea of getting a new car for so long. My mom, my friends, my clients..had directly or indirectly 'hinted', but I persevered. I had spent a lot of money on maintenance that finally it just doesn't make sense to keep it anymore. Its not coz of the money, its the 'downtime' and 'reliability' that gets on my nerves. I blame the workshop dude for this, it was not the car's fault. They simply treat cars like guinea pigs in a lab... 'trial & error' is the modus operandi when it comes to trouble shooting. Unknown to us, we are the one financing this 'not very smart analyzing method'. I think this is one of the solution that Proton Edar should adopt. Let customers have an option. If you have one dude doing for the whole of Malaysia, definitely there is gonna be a backlog for months. Cost saving? At what cost? The scrapping program is to stimulate the automotive industry, right? People get TURN OFF when salesman say "tapi kalau mau scrap ambik masa sikit 1-1.5 bulan. lepas tu baru boleh start order kereta. persona 1 bulan, exora 3 bulan". Only fools (myself included) would actually believe that its all a myth, that things weren't really that bad and order a Malaysian made car. If you cant handle the problem, at least listen to your customers for solutions and always give options. This take it or leave it attitude is bad for you. Basic marketing mahh. Come on Proton Edar...buck up and listen to your customers. 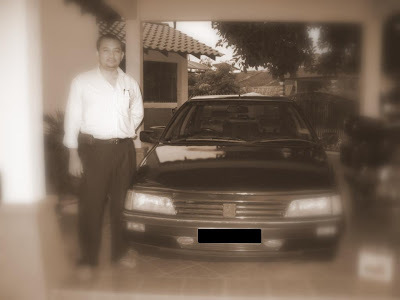 Hmmm...after using my faithful Peugeot 405 SRI since 1996, and after thousands of Ringgits spent on repairs, and countless encounters with friends and acquaintances giving me the cynical "kereta masuk workshop lagi" remarks, I had decided to change my car. A very sad decision indeed as that car had sentimental values. But what car to get? I had visited a few showrooms...namely Toyota, Honda...and last but not least, Proton Edar. Hmmm...that last one was originally just to pass the time...but wait, what's that? A scrap program for Malaysian made cars? How much? RM5000? Interesting. I came up with a plan...trade in my Peugeot and scrap my Datsun C20 which I had used for my previous 'projects'. Sounds good. After meeting up with 3 dealers, with 3 different versions of 'scrap' programs explanations, I told myself that the dealer that comes back to call me would be the one I would sign up with. At last, the nice gentleman name Sam did just that, and he took the trouble of actually doing most transactions at my house, which was on the opposite side of town from where he was. He told me that the 'scrapping' process would take between 1-1.5 months for the voucher to come out. Only after that would the process of buying a car can start. At first I was eyeing the new Exora, but I cant wait that long (at that time, Sam told me waiting list was 3 months...and that is not including the 'scrapping' process). So the next best thing was the Persona...430 litres is ample boot space for dive bags, medical bag, rescue kit etc etc. I went for the Persona SE simply because it has everything (the safety aspect)...plus for just an additional RM3k, I get GPS, leather seats, body kit, sporty gauges etc etc. To be honest, I have LOST that eagerness for my new car. Its gone...nothing, zero, zilch. No enthusiasm at all. Proton Edar has deprived me of that 'new car' feeling. If it wasn't for my french car already in the process of 'scrapping', I would have cancelled my booking and buy a Japanese car instead. I know my contribution is not much, maybe that's why Proton Edar doesn't give a hoots about 'little people' like me. So much for government's call to buy Malaysian products, but only a Malaysian company would treat a Malaysian buyer like this...the 'tak apa' attitude. Look at the export models...better quality, better safety. Why the double standards? Does the life of a Malaysian cost less than a 'Mat Salleh'? Btw, its meant to be 'scrapped'. The initial inspection all done by Puspakom PRIOR to 3rd June. What could possibly be so meticulous 'processing' that it takes them months just to issue out a voucher? RM59k maybe small to Proton Edar, but for a 'normal' dude with a 'normal' income like myself, that car meant less diving, less saving, less partying, less money for my kid's education etc etc. Its high time that big corporations like this have some degree of respect for the normal 'rakyat'. What say you?